The man for whom the year is named. Grandmasters are divided into two teams for the competition. 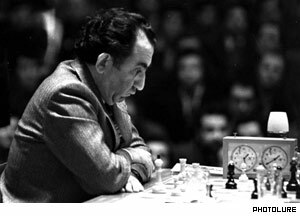 Tigran Petrosyan team includes such famous grandmasters as the current best chess player of the world Garry Kasparov (rating 2817). Peter Leko of Hungary (rank 4, rating 2741) and Boris Gelfand (rating 2714), representing Israel and ranked 13. There are also three best Armenian players in the team: Vladimir Hakobyan (rank 21, rating 2689), Rafael Vaganyan (rank 54, rating 2639) and Smbat Lputyan (rank 60, rating 2634). The World team also has strong chess players such as second best in the world Indian Viswanathan Anand (rating 2774), Russian Peter Svidler (rank 6, rating 2733), Michael Adams of England (rank 8, rating 2731), Etienne Bacrot representing France (rank 27, rating 2675), Francisco Vallejo from Spain (rank 35, rating 2666) and finally Dutch chess player Loek Van Welly (rank 46, rating 2651). After the first round, the World Team (WT) leads Tigran Petrosyan Team (TPT) 3-2. Earlier this year another tournament dedicated to Tigran Petrosyan 75th Anniversary took place in Stepanakert, Karabakh, where ten chess players from Armenia, Russia, Switzerland, Poland, Latvia and Iran were competing for the trophy. That was the first international sporting event organized in Nagorno-Karabakh Republic.